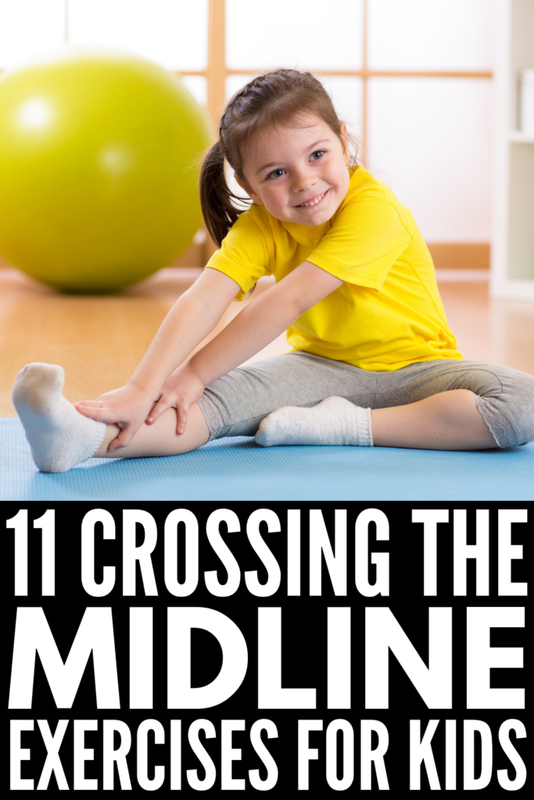 Whether you’re new to the term ‘crossing the midline’, or you’re an old time pro looking for helpful activities for kids to inspire you in the classroom, during Occupational Therapy, and/or at home, this post has it all! We’re explaining what crossing the midline means, why it’s so important, warning signs your child may be struggling, as well as 11 fun and effective crossing the midline exercises for kids that feel more like play than practice. What Does ‘Crossing the Midline’ Mean? When an Occupational Therapist uses the word ‘midline’, they are referring to an imaginary line that divides the body in half. ‘Crossing the midline’ refers to a person’s ability to reach over this imaginary line with an arm or leg, and perform a task on the opposite side of their body. Why is Crossing the Midline So Important? It means the left and right hemispheres of the brain are communicating properly. Since each hemisphere of the brain is responsible for different tasks, communication between the two is essential for proper learning, coordination, etc. It helps improve fine motor skills. If a child cannot move his or her dominant hand across the midline spontaneously, he or she will use both hands within their respective hemispheres rather than developing strong fine motor skills with his or her dominant hand. This can have significant implications on a child’s handwriting as well as other important life skills. It helps develop reading skills. An inability to cross the midline can also make it difficult for a child to visually track something from left to right, which can make reading more challenging. Appears ambidextrous. Children who have difficulty crossing the midline may use their right hand to perform tasks on the right side of their body, and their left hand to perform tasks on the left side of their body. It may seem that they are ambidextrous, but what’s actually happening is that they aren’t properly developing the fine motor skills in their dominant hand. Instead, they are essentially developing average skills in both hands (instead of superior skills in their dominant hand), which can have significant implications in the long-run. Has poor handwriting. When a child can’t cross the midline, they often change hands repeatedly while writing, drawing, coloring, etc. Handwriting may be more challenging, and their school work may be sloppy and messy since they aren’t developing strong fine motor skills in their dominant hand. Has difficulty carrying out life skills. An inability to cross the midline can have a huge impact on a child’s ability to perform basic life skills, like brushing teeth and hair, doing up buttons, zipping up zippers, putting on socks and shoes, etc. Demonstrates poor gross motor skills. A child who can’t cross the midline will likely struggle with gross motor activities. For example, they may struggle to kick a ball with two feet instead of fine-tuning this skill with only their dominant foot. Appears uncoordinated. This is sort of a continuation of the point about, but kids who can’t cross the midline also struggle with more complex gross motor activities that require greater coordination, like jumping with a skip rope or doing jumping jacks. Has difficulty with reading. As mentioned earlier, kids who can’t cross the midline may find it more difficult to visually track something from left to right, which can result in delayed reading skills. 1) Side bends. Have your child stand tall with his or her hands reaching for the sky, and then ask him or her to bend his or her torso to the right so his or her arms are pointing in that direction. Return to the middle before bending to the left. 2) Hot potato. If you’re looking for fun crossing the midline exercises for kids you can do with larger groups, this is a great one. Have the group sit in a circle and then ask them to pass a ball (or a real potato, if you prefer!) with both hands quickly around the circle while you play some fun music. Once the music stops, the person who is holding the ‘potato’ is out. The game continues until only one person remains. Be sure to switch the direction the kids pass the potato, and if you want to make this game extra fun, check out this LOL Surprise! : Pass the Surprise Game! 3) Figure 8s. There are so many ways you can do this, but the idea is the same regardless of which option you choose. Draw a large figure 8 on a chalkboard, piece of paper, or with chalk on the sidewalk, have your child stand/sit in the middle of the figure 8, and then ask him or her to trace the shape using his or her finger, a pencil, a piece of chalk, etc. using his or her dominant hand. The shape of the figure 8 will force him or her to cross the midline while tracing, making this one of the easiest crossing the midline exercises for kids! You can make this extra fun by using shaving cream and a cookie tray if you want to add a sensory component to this activity. 4) Windmills. Have your child stand tall and then ask him or her to bend over at the waist and touch his or her left foot with his or her right hand. Return to a standing position and then repeat with the opposite hand and foot. 5) Twister. A collection of crossing the midline exercises for kids wouldn’t be complete without the classic game Twister! It’s heaps of fun, gets kids laughing, and it’s a great way to get them more comfortable with crossing their arms and legs over to the opposite sides of their bodies. 6) Household chores. If you’re looking for crossing the midline exercises for kids that are simple to setup, wiping down tabletops, washing the windows, and even washing the car are all great options. The idea is to have your child use his or her dominant hand for these activities and to make large sweeping motions. 7) Bicycles. If you’re looking for a way to work on your abs while spending time with your child, this is a great activity to do together! Have your child lie flat on his or her back with his or her hands behind his or her hand. Next, ask your child to bring his or her left elbow to his or her right knee before returning back to a lying position. Repeat on the opposite side. 8) Exercise ball fishing. Sounds weird, I know, but I promise it’s fun! Have your child sit on an exercise ball and scatter pieces from this Melissa and Doug magnetic fishing game on either side of the ball. While holding the puzzle board in front of your child, say out loud which colored piece you’d like him or her to ‘fish’ for using the fishing wand. Make sure your child doesn’t move his or her body so he or she has to reach across the midline to retrieve the pieces with the fishing wand before placing them on the puzzle board. 9) Sorting on an exercise ball. Before you put the exercise ball away, here is another one of my favorite crossing the midline exercises for kids. Have your child lay down on his or her tummy, and ask him or her to sort items from one side to the other. For example, you could use this Learning Resources Birds Next Sorting Set and place the ‘birds’ on one side, and the ‘nests’ on another, requiring your child to cross the midline over and over again to place the birds in their respective nests. 10) Simon Says. Kids love this game, and you can easily turn it into a crossing the midline exercise. Have your child stand tall, and then lead him or her through different gross motor movements: ‘Simon says touch your right hand to your left knee’, ‘Simon says do 3 jumping jacks’, ‘Simon says reach your hands over your head and then lean to the left’, etc. At some point throughout the game, provide a command without saying ‘Simon says’ first, and whomever completes the movement is out. This is an activity the whole family can enjoy! 11) Learn to dress boards. The last of my crossing the midline exercises for kids is to purchase ‘learn to dress’ boards to help your little one practice things like buttoning buttons, zipping zippers, lacing laces, snapping snaps, etc. This Melissa and Doug Skills Board is relatively inexpensive, and I love these individual Learn to Dress Boards by Blue Sky as well! I hope the information in this post, as well as the super fun crossing the midline exercises for kids, proves useful to you! If you found these crossing the midline exercises for kids helpful, please share this post on Pinterest! And if you’re looking for more tips and activities to help children with developmental delays, please follow our Special Needs Parenting board, where we share all kinds of helpful ideas we find each day!